We’ve been speaking with some of our clients about trends in the future of digital advertising. It seems clear that the future is about personalization, automation, and getting connected. We can’t help but notice how many of these trends require not only a great understanding of technology and marketing, but also, a great understanding of language and translation services. For example, videos and podcasts are becoming a “must have” part of marketing campaigns. Translating for audio and video is a very different skill than translating for print. Audio and video translations have two separate components, the translation and the recording. 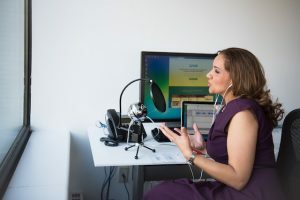 It’s important that marketers who want to take advantage of these new marketing opportunities have both high- quality translations and recordings. The same is true for those creating content for voice assisted devices, such as Alexa and Google Home. Over 39 million Americans own some sort of smart speaker device, and that number is expected to grow. Brands are extending their advertising campaigns on to these platforms. This extension can include adding an audio component to existing ad formats, or setting up an audio trigger to activate or offer a promotion or call to action. Everyone wants to be spoken to in a language they understand, meaning audio translation services are more important than ever. Not only is it important that these promotions and campaigns be translated, it’s important that they be translated precisely into local dialects. New digital platforms deliver detailed information to marketers who have interacted with their ads. Access to data is immediate, allowing brands to revise and improve their campaigns in real time based on insights gleaned from the data. All of this precise and immediate access to data has resulted in a new level of personalization that helps marketers and that today’s consumers have come to expect. Meaning, it’s no longer sufficient to simply translate your campaigns into a language, you need localization services. Studies show that 80% of consumers are more likely to do business with a company that offers a personalized experience. Nothing is more personal than language, and being able to talk to customers not just in their own language, but their own dialect is an important marketing advantage. Talking to customers in their own specific dialects is only going to become more important as smart technology and augmented reality, another of the projected trends, become more popular. For virtual and augmented reality to be effective, the user must be completely immersed in the reality. Only software that is precisely translated will be able to achieve this level of immersion for customers. If all of this focus on globalization, localization, and personalization is making you wonder if you’re behind the curb, we can help. We have several free e-books, white papers and even webinars to help get you up to speed. At Alpha Omega translations we provide translation services in over 200 languages. We work with clients in a variety of industries including software and marketing. We know how important it is for you to keep up with the newest trends in your industry, and have partners like us that do the same. If you have global marketing and advertising needs, contact us for translation services.